This is what happens Larry, when you misuse technology…. If you do not get the reference made by the title, then you you can spend the day trying to figure it out. Improve your Google skills, or whatever. I know that my fellow podcaster, Preston, will get it, and he is the inspiration for this post. I invited Preston and some others to watch the premier of Star Trek: Into Darkness. 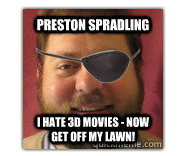 The premier was in 3D, and so Preston said, “I hate 3D. I am not going.” Even though he likes Star Trek, he refuses to watch 3D. He feels, and rightly so, it is over used. Apparently he has had one too many bad 3D experiences in the last few years. Yes, we can blame James Cameron for this, he did bring back 3D from the dead with Avatar, but, that is not really true. He did not bring back 3D, he literally reinvented it. He had his teams building hardware, software, and special computers to create a movie that was designed from storyboards to be 3D. That is why it is a great movie, 3D was the planned medium. The Star Trek film was also designed for 3D. As I predicted, the 3D was not distracting, it was just part of the film. A film designed to be in 3D. Then there are films such as the much overhyped and widely loved Harry Potter series. I watched one of the films in 3D. It was awful. Obviously, they converted it to 3D in post production. Researching this topic, I found this was attempted on another Harry Potter, but the results were so bad they canceled the plan. Unplanned technology, creates a bad experience. Misused technology creates a bad experience. In grad school we looked at some research, and this was ages ago back in 2001-2002, but it has stuck with me. The stats read that people had the same neophobia with technology that they did with food. If someone has a bad experience, it could take up to seven, and sometimes as many as ten, more exposures to get them to move past their first initial bad experience. As I have been working in educational technology, I have found that this theory is very accurate. Preston had a bad experience with 3D. More than one. He kept attending movies that he was genuinely interested in, but still left those movies feeling annoyed because of unplanned and misused technology. He was motivated by the content, yet, he still had an adverse reaction. Preston is not alone, because 3D technology being misused and abused is just a small percentage of technology that is often injected without a plan into educational technology. Obsession with QR codes, time-consuming presentation technology, apps that do not allow for any creation only consumption, wikis, Twitter for backchannel chats, expensive analog response systems, and of course the Coomber potable audio recorder (which looked like it was made in 1975 when sold to schools in 2009). All of these technologies have legitimate uses in education. Even the Coomber would be useful in a school based in the Arctic or in one of those towns that prohibits wifi technology. However, most of the time, the uses for these technologies would be considered niche. They would plug-in to enhance a larger plan or project, if that project was designed for plug-ins. Keeping people of all ages interested in learning can be challenging. Impacting learning negatively with extraneous unplanned technology is only going to stifle educational technology initiatives. The curriculum and the educational goals should naturally lead people down a path to appropriate technology. It is true that technology can create new insights and new directions, but that is only true if those things exist in unity with educational process. Wrapping this up, a word to Preston. The use of 3D in “Star Trek: Into Darkness” is appropriate. In the first scene, the entire theater shifted to the right to dodge a spear moving at high velocity. Wait, and watch it in 2D. Then, watch it in 3D if you liked the story. Avoid all 3D TVs and other 3D technologies until you have done this. And remember, when planned appropriately 3D abides. This entry was posted in Educational Technology, entertainment, Instructional Technology and tagged 3D, BadPlanning, edtech. Bookmark the permalink. 3 Responses to This is what happens Larry, when you misuse technology…. This is a couple of years old, but you might like this one too. Here’s some food for thought, as part of this conversation. The Chinaman is not the issue!